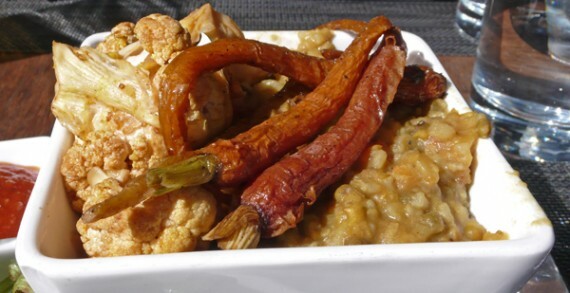 all you can eat vegan buffet at savyon is here to stay! vegans, rejoice! 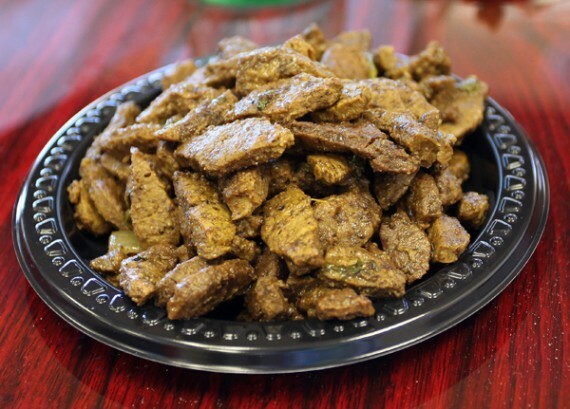 savyon cafe on pico has officially decided to offer their all you can eat vegan buffet every sunday from 11:30am to 4pm! every sunday at lunchtime! all you an eat for $8.99! 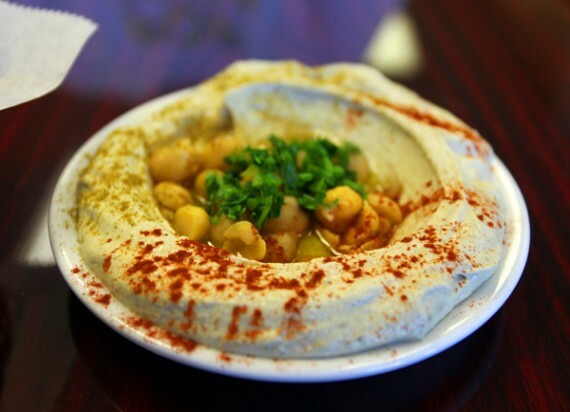 hummus king drastically cuts hours: EAT THERE WHILE YOU CAN. 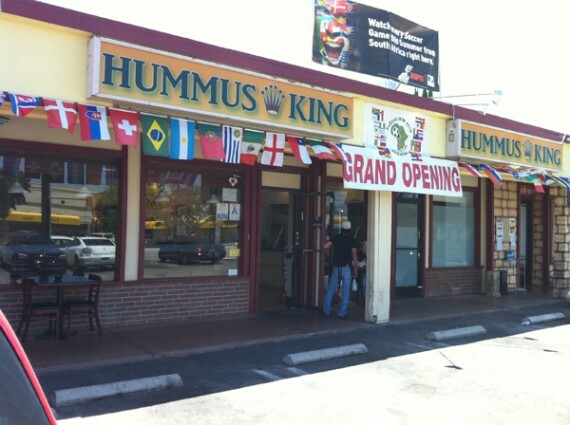 you people better get over there and eat at hummus king, because this is NEVER a good sign. 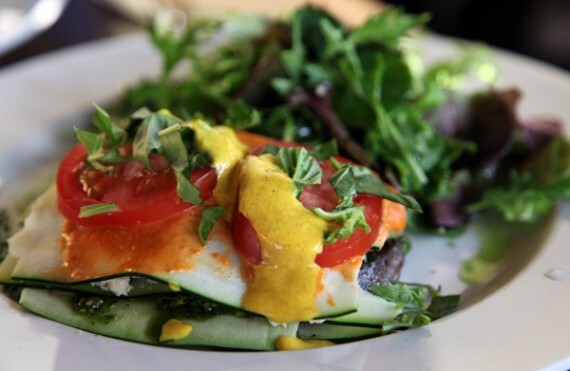 the entirely vegetarian restaurant in valley village has slashed its hours, and is now only open sunday through friday until 4pm. they used to be open until 10…so that means they’ve chopped their hours IN HALF, and will no longer be serving dinner. field report time, and this one comes to us from a new operative located way over on the other side of the country! 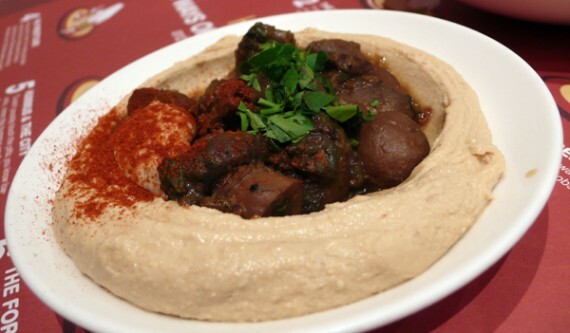 check out christina’s review of baladi, a middle eastern restaurant in virginia beach. this post seriously had me drooling. it’s got vegan baklava, turkish delights, and the best looking plate of hummus i’ve ever seen. enjoy! Attention all military families, beach travelers, those visiting PETA in Norfolk, or anyone else mysteriously finding themselves in Hampton Roads, VA: I have found a gem in the seven-cities. By chance one morning, I bumped into Khaled, the owner of the Mediterranean restaurant Baladi in Virginia Beach as he was delivering food to my workplace for lunch. You don’t have to pull my arm to get me to try a new Mediterranean restaurant—by the end of the workday I was dying to take that thirty-minute drive to his restaurant to scope out the falafel. 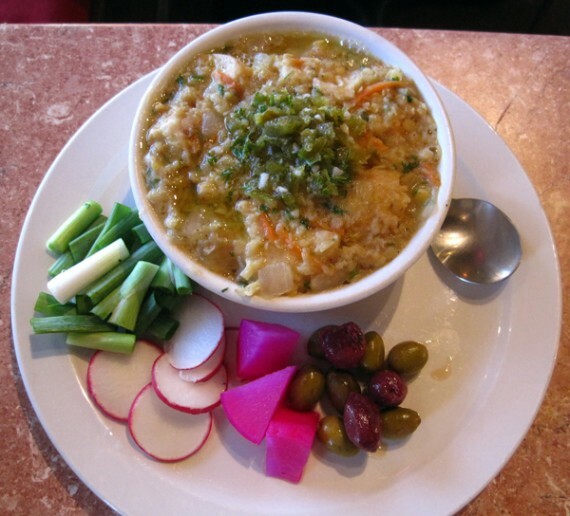 Needless to say, Baladi has become a restaurant that I frequent—due to the superb customer service, the vegan-friendly menu, and the drool-worthy dishes. 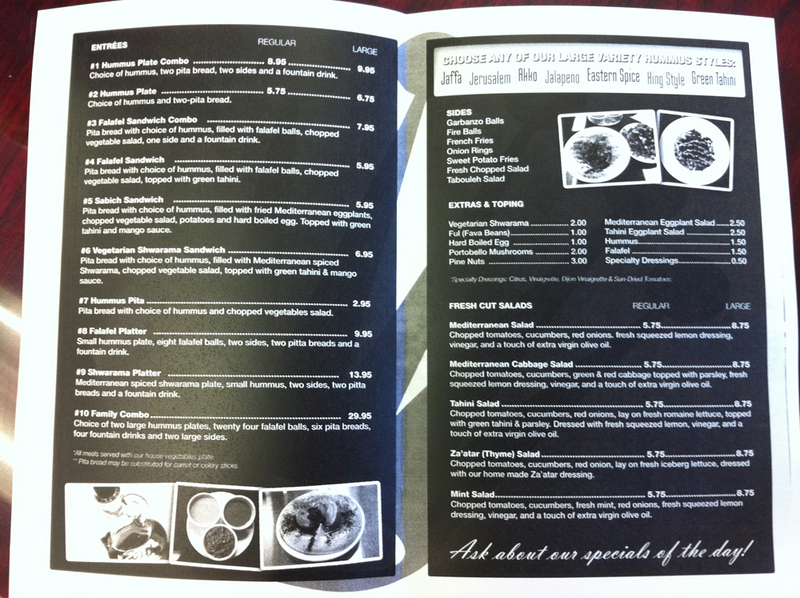 Each vegan item on the menu has a “VV” next to it, which makes me want to high-five everyone around me. 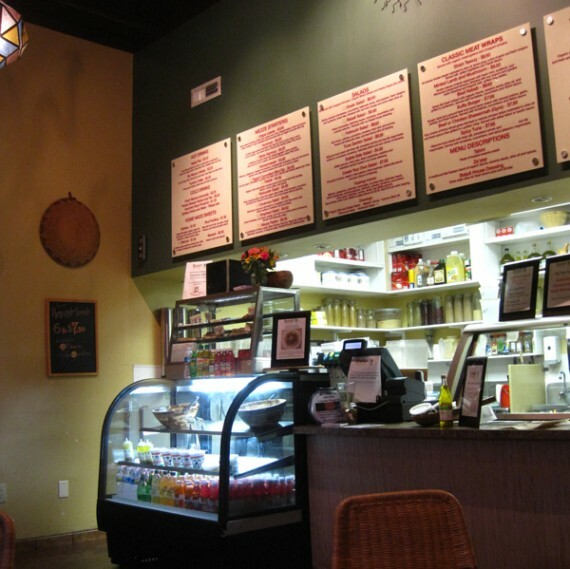 The word “baladi” in Arabic means “local,” and the restaurant most definitely has a local vibe. The owner is ALWAYS there—taking orders, preparing food, delivering food to tables, learning customer’s names and humoring you if you try to speak mediocre Arabic with him (so what? At least I try). Baladi’s ambiance also happens to be refreshingly unique. I feel like it would have been a nice place to study during college—if there were more seating. 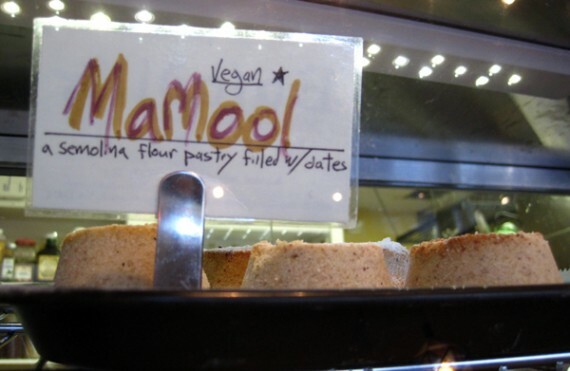 The pastry case at Baladi regularly contains vegan mamool, vegan baklava, and Turkish delights. I’m the sucker that ends up purchasing so many sweets that I have leftovers for days (if you’re wondering: yes, these treats still taste amazing three days later). There is even a deal for people like me: six sweets for $7.50. The Jalapeno Hummus with spicy garnish is hands-down the best hummus I have ever eaten. I have no idea what “spicy garnish” is—but it is bangin’. 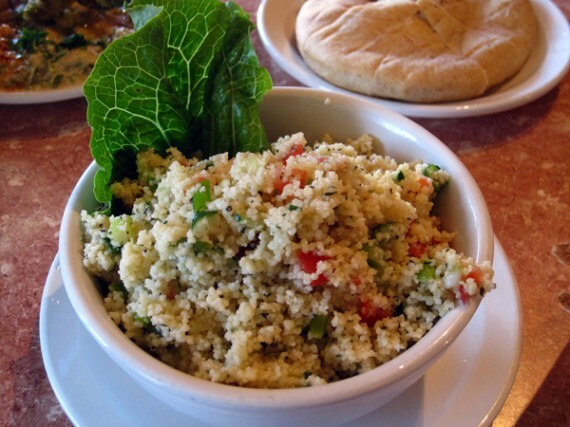 Both the tabbouleh (above) and the couscous (below) are part of the mezze menu, and are affordably priced ($4.95 each!). 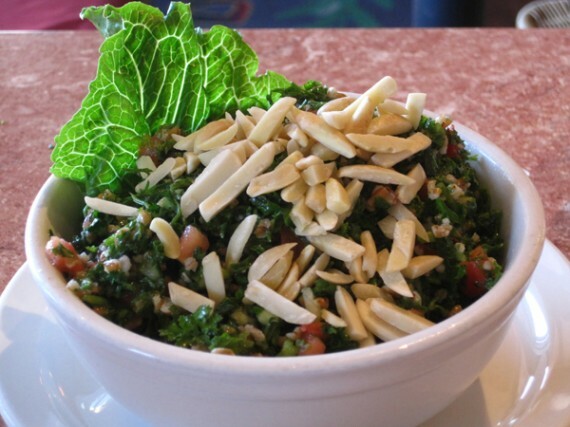 The tabbouleh is fresh, not too lemony. The couscous is joist moist enough and has some tiny bits of green onion and tomato mixed in. A little lady, such as myself, could purchase one of these and be perfectly satisfied. 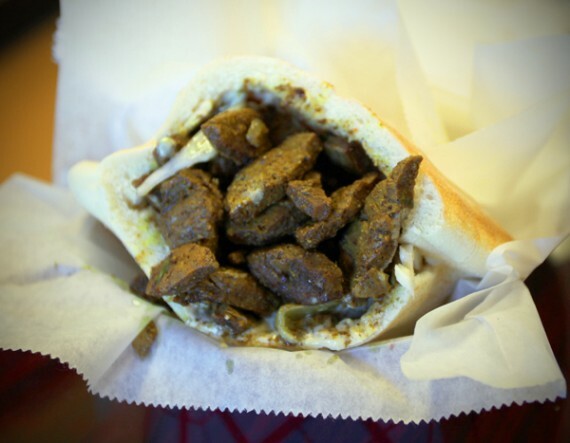 Seriously—Baladi consistently crafts the perfect falafel. 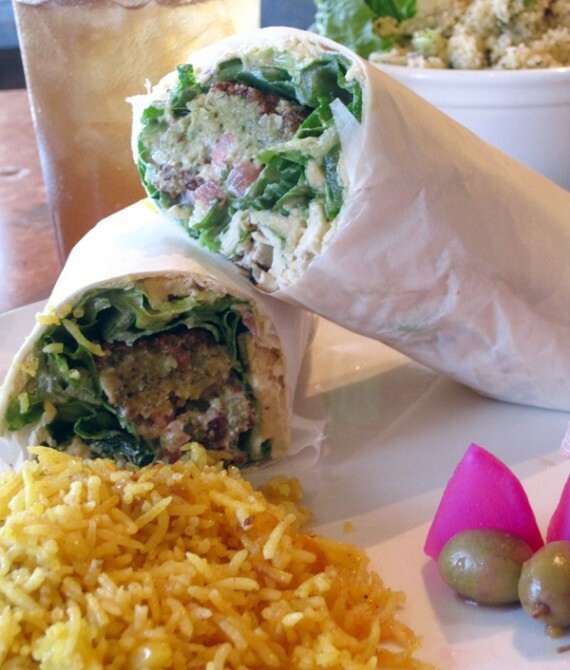 Above is the Falafel Supreme wrap (crunchy lettuce, warm falafel, hummus, tahini, and Lebanese olives on the side. Mmmm). This baby is only $7.50, too. 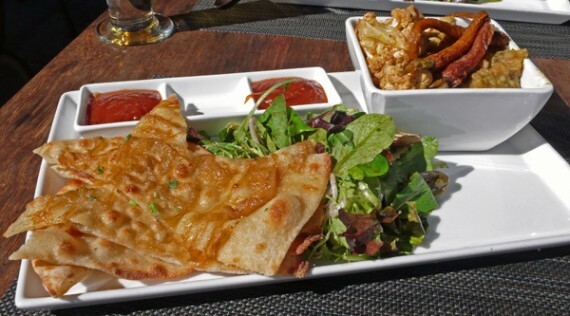 This dish is a dream … thick pita bread covered in lentil soup and topped with that wonderful spicy garnish. 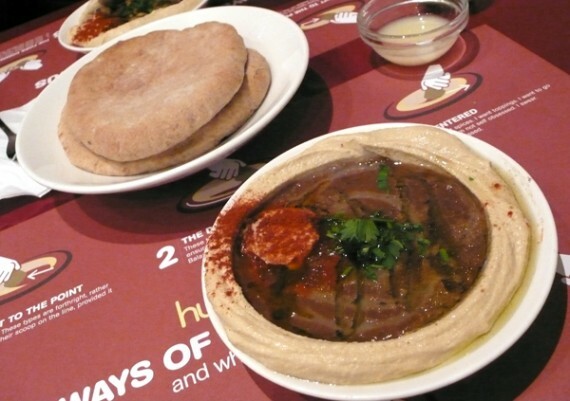 The lentil soup here is spectacular by itself, but there is something about eating thick, soup-soaked pita bread that makes me drool a little. 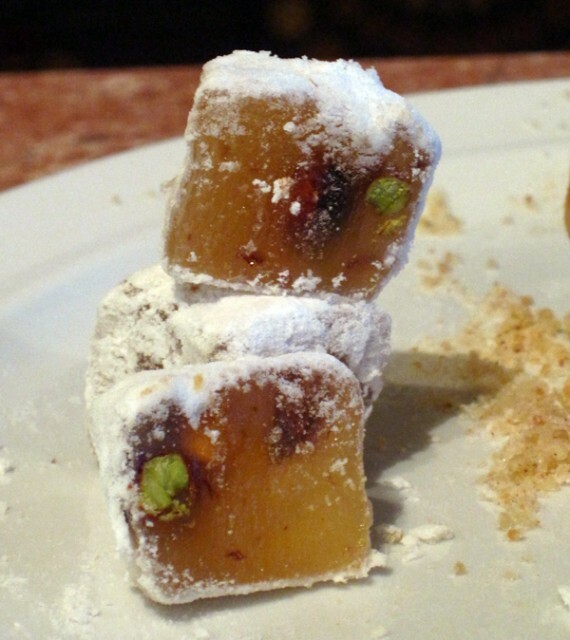 These Turkish delights turn me in to an American delight—all I’m sayin’. They’re coated with just enough confectioners’ sugar and they’re not so chewy that they stick in your teeth (in case you want to talk later). I grew up on this stuff as a kid. 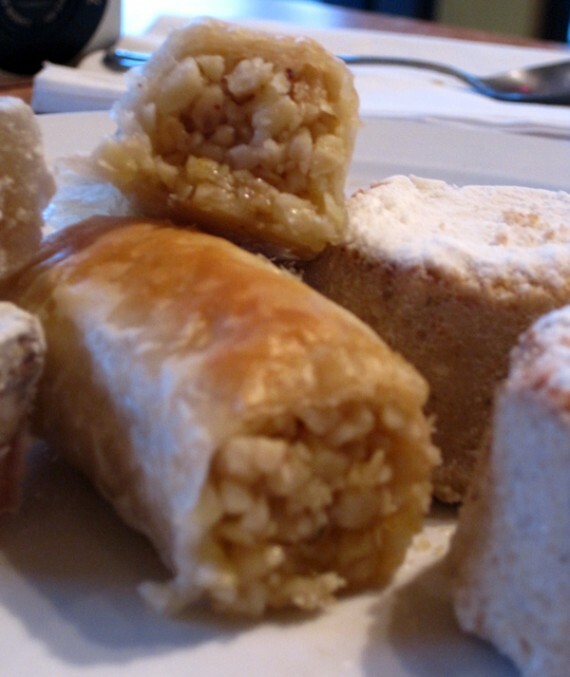 Until I was 14, I thought baklava was a staple at everybody’s Thanksgiving and Christmas dinner, thanks to my Arab-American family. 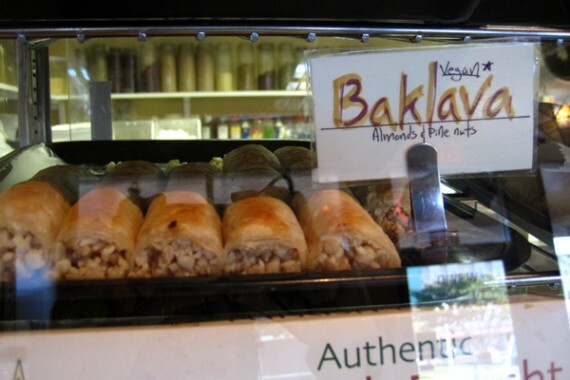 After transitioning to veganism I really missed baklava, so this is a great find for baklava fiends—or anyone wanting to have their taste buds tantalized with phyllo dough, rosewater, and pistachios. 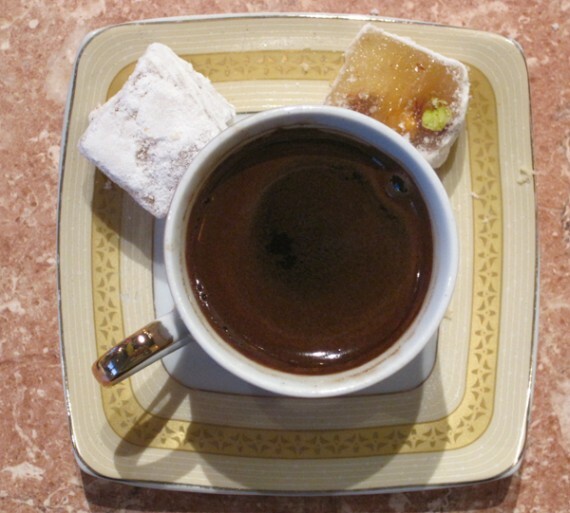 No one should ever leave here without getting a Turkish coffee. It’s always made fresh, and it’s served in the most elegant of demitasse cups and saucers. They’re so fancy that I take them up to the counter after I bus my table so they don’t get broken. I know, I know. I’m a sweetheart. oh god, i love NYC. it’s freaking vegan paradise, lemme tell you. i have that happycow app on my iphone…you know, vegout? it’s this cool little thing you fire up and no matter where you are, it uses GPS to tell you which vegan-friendly restaurants are nearby. in LA, it usually results in a few pages of restaurants, depending on where you are in the city. in manhattan though, the app almost crashes…there are SO MANY VEGAN OPTIONS. it’s crazy. there are more vegetarian places per square foot in nyc than anywhere i’ve ever visited. anyways, this post isn’t supposed to be a vegan love letter to NYC…i am here to talk about kate’s joint! 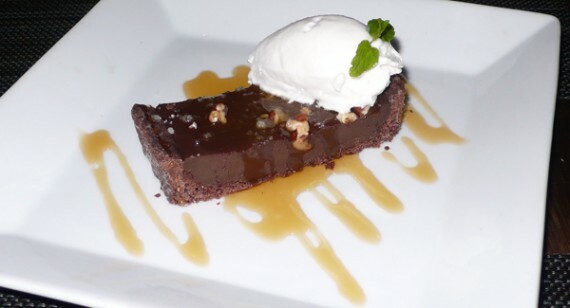 kate’s is an all vegetarian spot that our friends have been recommending to us for quite awhile. 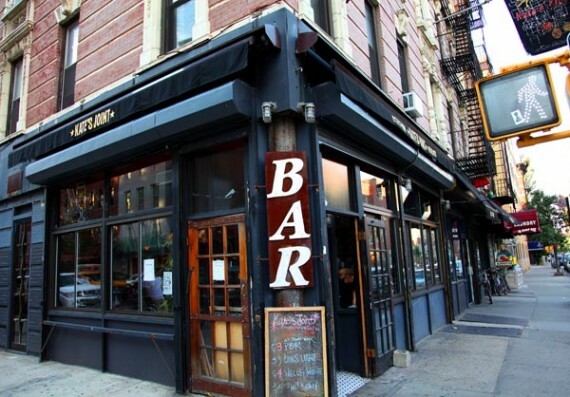 i’d heard nothing but good things about the restaurant, so when they showed up on the vegout app as “less than a mile away” while we were drinking in the east village, i knew it was gonna happen. 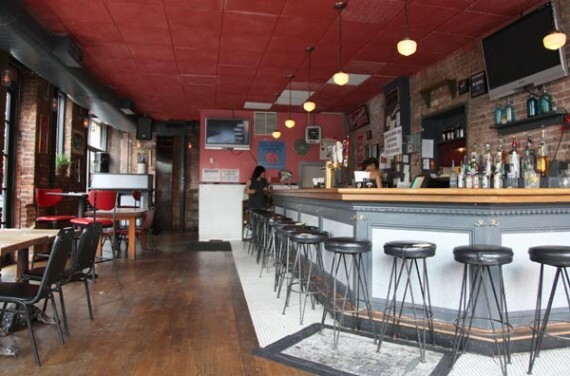 lemme preface: kate’s has an enormous menu, but it feels more like a bar than a restaurant. they’ve got tap beer, cocktails, and a huge bar lined with stools in the main area; dining tables are lined up along the windows. this actually got me pretty excited, because i love bars much more than real restaurants. 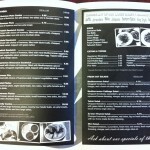 so the fact that i can think of this place as a bar with an all vegetarian menu makes me love it even more. we hit up kate’s on a friday at around 5pm, and it was pretty slow. 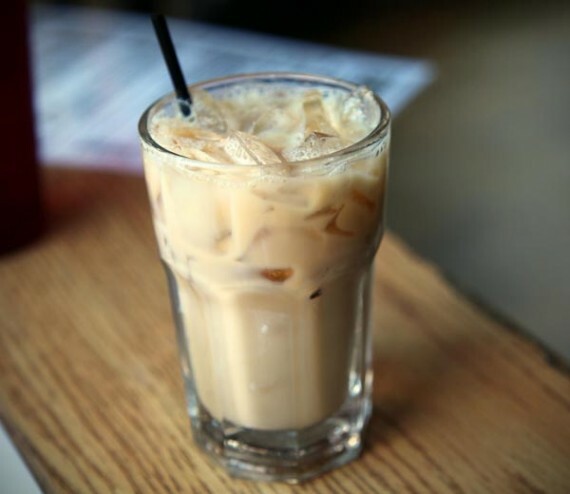 i had heard they made vegan white russians (my favorite drink ever), so i ordered one right away. the waitress had no idea what i was talking about, but she went to check with the bar and immediately came back with one. SCORE! it was so good. next up, we decided to order some appetizers. we started with the decadent “disco fries,” another legend i have been hearing about from several peeps. 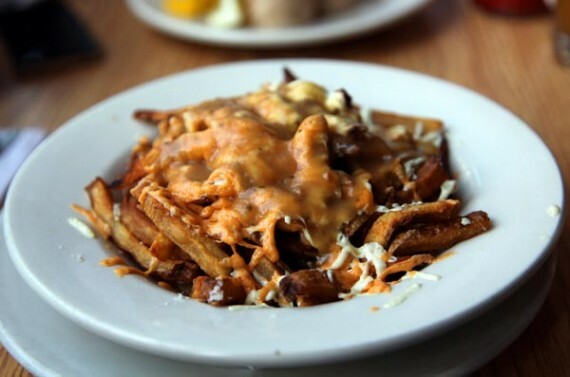 disco fries are ridiculous: french fries topped with GRAVY AND CHEESE. WTF, why didn’t i think of this?!?! these have been at kate’s forever, but are only recently vegan-friendly. not long ago, kate switched from a casein-containing soy cheese to daiya! thank goodness, because why would a VEGETARIAN RESTAURANT have a real cheese option, AS WELL AS a non-vegan cheese option? that makes no sense. anyways, the disco fries are available vegan now and they are amazing. by far the best thing i tried at kate’s. 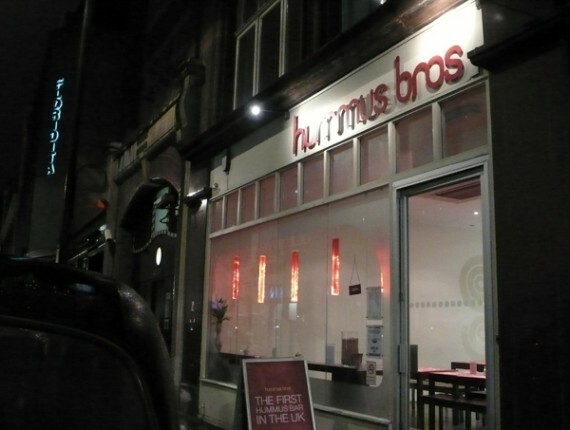 after that deep-fried, cheesy, creamy starter, we were in the mood for something lighter and shared the hummus rolls. these babies were basically little tortilla pockets filled with hummus and vegetables including spinach, garlic, and tomato. nothing earth-shattering, but damn good. we had such honorable intentions of ordering like 5 entrees from kate’s, but after the two appetizers, we could only manage to share one main course. 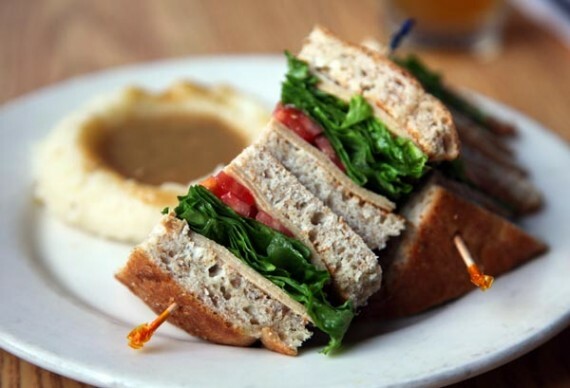 we went with the un-turkey club, another popular item that we’d heard people rave about. the club was delicious, but IMO we have better clubs here in LA. 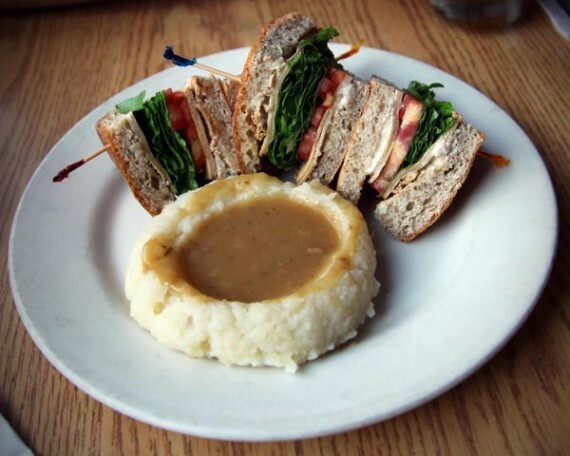 what took this sandwich over the edge was the side of mashed potatoes, served with kate’s deadly homemade gravy (the same stuff that was on the fries). it was phenomenal. next time i go to kate’s, i am gonna starve myself in advance and arrive completely sober. the menu is way too drool-worthy, and the drink selection is too tempting. to say that we have unfinished business with kate’s would be an understatement. 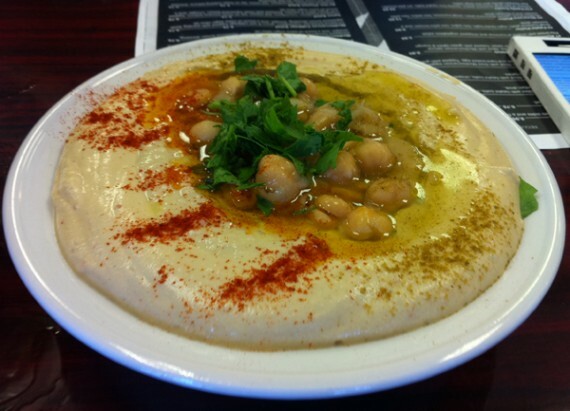 ever since we posted brittany’s glowing review of hummus king, an all vegetarian restaurant in valley village, we have been dying to go there. we finally made the trip this weekend, and i can safely say that it’s one of my new favorite spots. 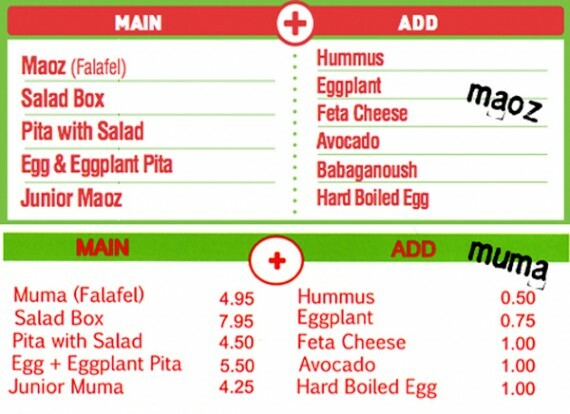 the menu at hummus king is large, inexpensive, and almost entirely vegan (i think the only animal products at the restaurant are eggs as a topping). 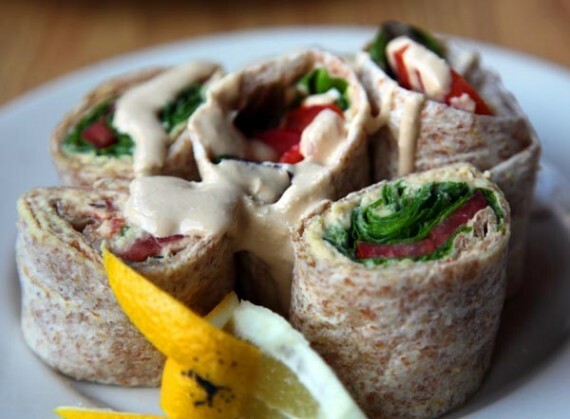 they’ve got several platters, salads, and sandwiches filled with your choice of homemade falafel, spiced vegan shwarama, and SEVEN different kinds of hummus to choose from. the second we walked in, a friendly fellow behind the counter started whipping out spoons filled with hummus, offering us a chance to try each flavor. they were all super tasty; i knew immediately that we were in for an awesome meal. 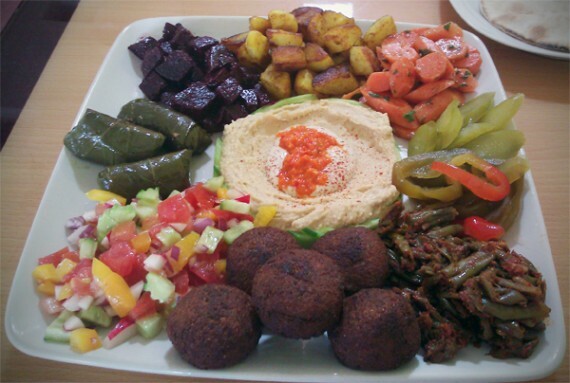 we decided to share the falafel platter, which isn’t a platter at all, but rather several small plates of food. this would probably be enough to feed 2 people, or one VERY hungry person. our platter came with 8 falafel balls (a mix of normal and fire flavor), a side of salad, a side of shwarama, a side jalapeno hummus, 2 pieces of pita bread, and fountain drink. lemme start by saying the falafel was FANTASTIC! some of the best i’ve ever had. super fluffy in the middle and crispy on the outside, yet not burnt to a crisp. it wasn’t overly oily, and it was perfectly seasoned. 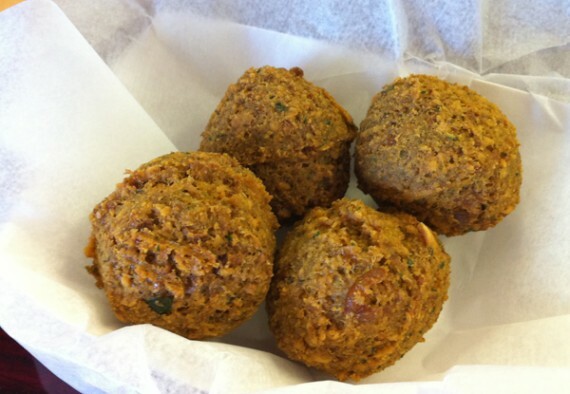 i highly recommend doing what we did and asking them to throw some “fire balls” (spicy falafel) into the mix, because those were even better than the normal falafel. the side of shwarama that came with the falafel platter was huge, i couldn’t believe it was just a side when they brought it to our table. one bite of this stuff and i was in love—thinly sliced and super meaty, it was all mixed up with fantastic mediterranean spices and little bits of grilled onions. 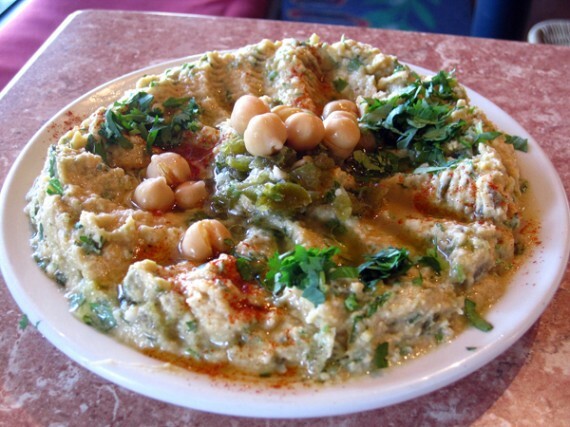 i’m definitely gonna work this shwarama into my order every time i go to hummus king. the salad was very nice as well, light and refreshing with crispy cubes of cucumber, plump tomatoes, and shredded cabbage. it went great stuffed on top of the falafel in the warm pita bread. the last component of the falafel platter, the small side of hummus, was probably my favorite thing on the table. there were so many flavors to choose from, but we went with jalapeno and were not disappointed. this was some of the creamiest, most flavorful hummus i’ve ever tasted and it was finished off with a chunky scoop of chickpeas and some spiced oil. TO DIE FOR. i honestly wanted to pick up the plate and face palm it. the falafel platter was so good, i would highly recommend it! i mean just look at the four pictures above—all that food for under 10 bucks! 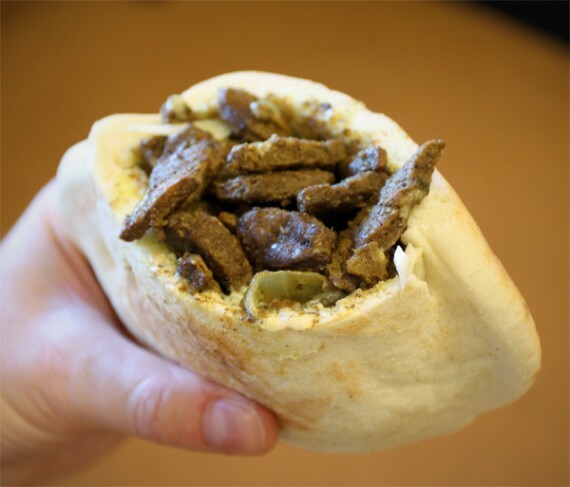 and you can’t even see the pita bread! oh, but that’s not all my friends. 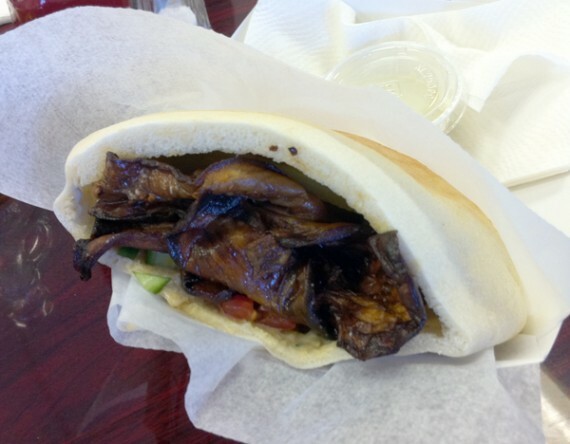 not knowing how epic the falafel platter would be, we also got a shwarama sandwich to share. this was a very generous portion of the same tasty fake meat described above, shoved into a soft pita picket with salad, hummus, and green tahini. i would order this hefty hand held meal again any time, it was wonderful! it was all the deliciousness of the shwarama, salad, and hummus i described above neatly tucked together in an easy to eat sandwich. if i were at hummus king on my own for lunch, this would be my go to meal. it’s the right size for one person without having any leftovers. 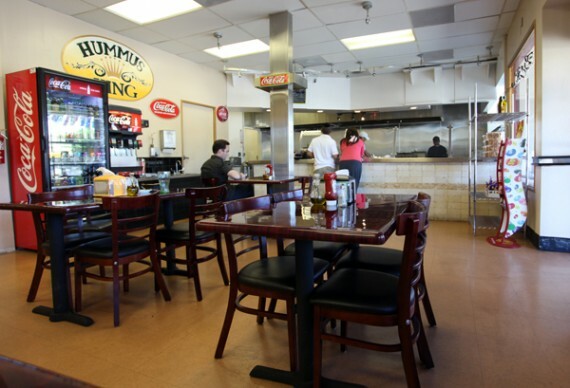 our first experience at hummus king was phenomenal, and just thinking about it makes me want to drive over there right now. the place is pretty basic on the inside (as you can see in the picture above), but the food is out of this world. 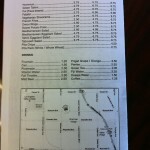 plus, the service is friendly, the prices are low, and you can sample pretty much anything you want before you order. oh, and it’s kosher! 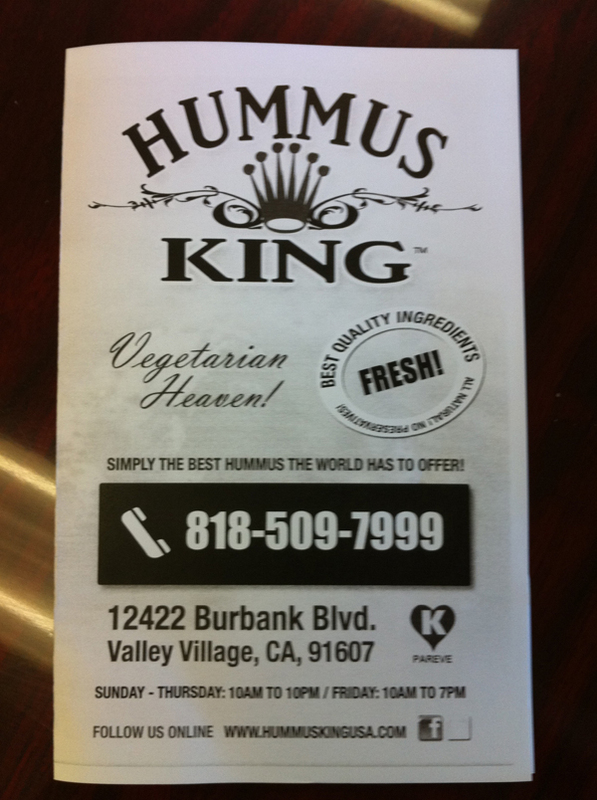 get over to the valley and show this vegetarian business some support! you will thank me later. 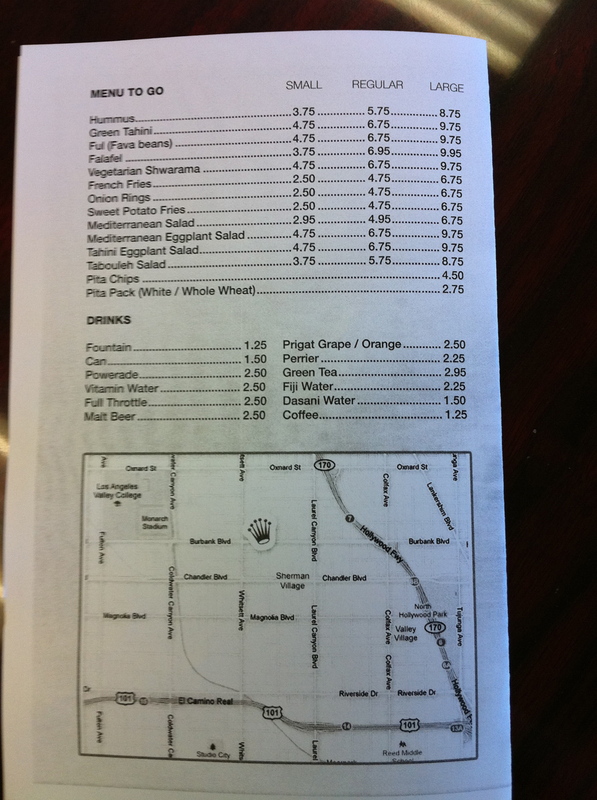 click here and here for the menu. 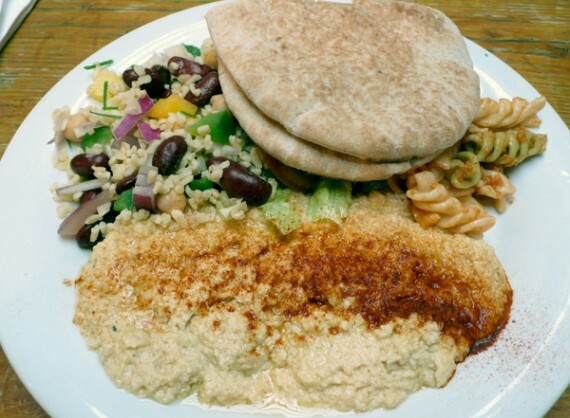 whenever i travel to london, i always look forward to eating at maoz vegetarian. 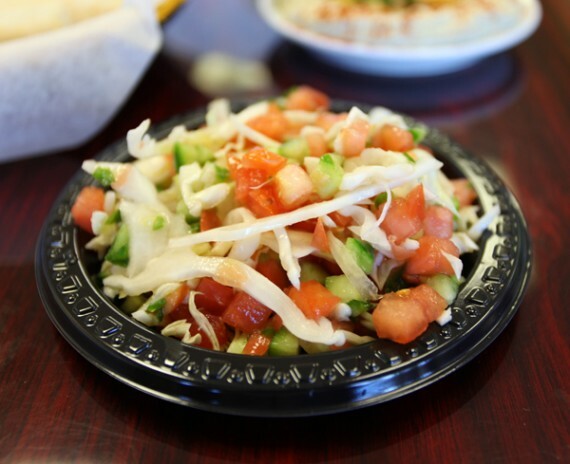 the concept of the restaurant is simple: a small shop that serves open pita sandwiches with base ingredients such as falafel and hummus, with a heaping salad bar full where customers can fill up on any toppings they want. 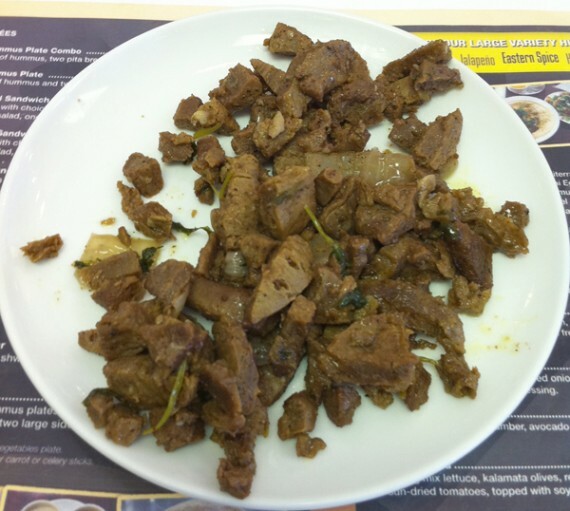 fast food without all the dead animals…what a great idea! my default meal is a pita with hummus and falafel, generously stuffed with the delicious salad bar options. 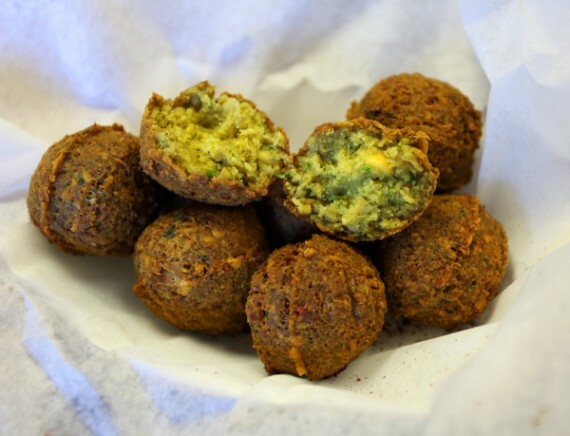 their falafel is some of the best i’ve ever had, perfectly spiced and crispy, and they don’t skimp on it either! almost everything at maoz is vegan, and i always wind up a sandwich weighing about three pounds—overflowing with broccoli, cous cous, cauliflower and hot sauce. 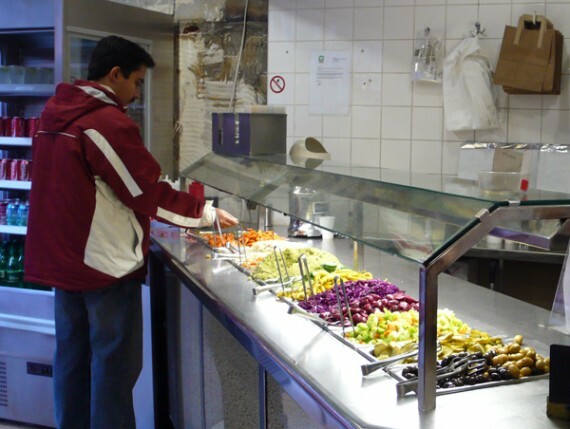 everything at the salad bar is crisp and freshly prepared…i really wish maoz would open up in los angeles, because i would be there everyday. 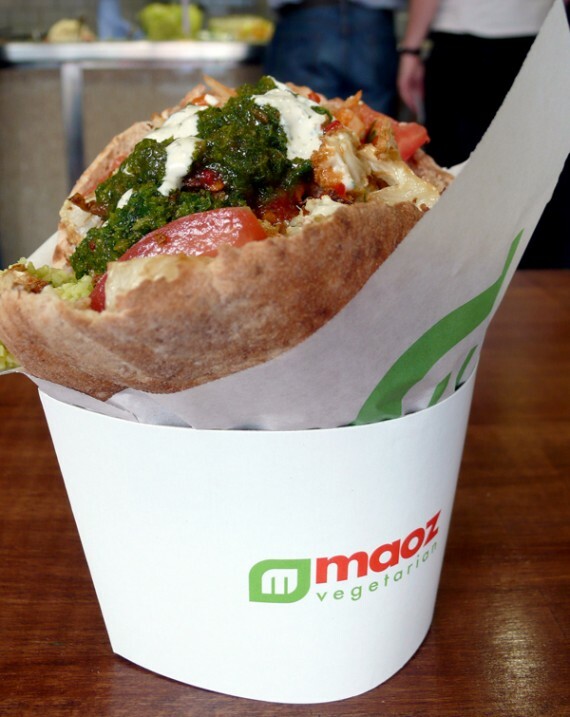 the only down side of maoz in london is, it can get pretty packed and hard to find a seat—and you don’t wanna be huddled under a roof in the rain, juggling an overflowing sandwich. luckily though, the line moves fast and the tables turn over pretty quickly, so my advice if the place is crowded would be to wait until a seat frees up. we’ve posted on maoz in london before, and since then they’ve re-arranged the shop a bit to make it more classy and fit in more seating. 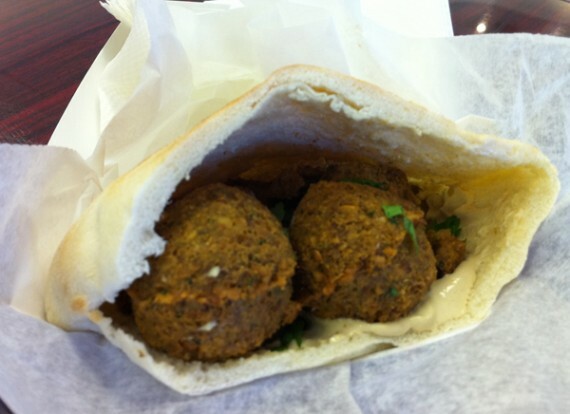 the falafel is still exactly the same though, so tasty that it haunts my dreams when i’m back home in los angeles. 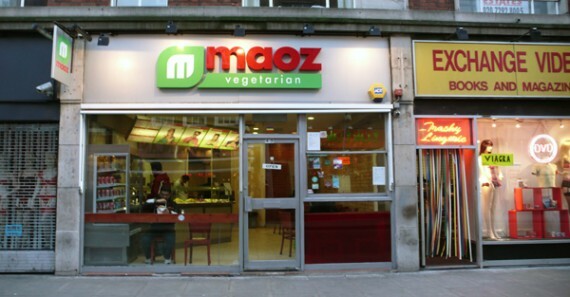 luckily, london isn’t the only place you can enjoy maoz vegetarian. they have locations in paris, spain, amsterdam and nyc as well. and soon they will be opening a shop in san francisco! 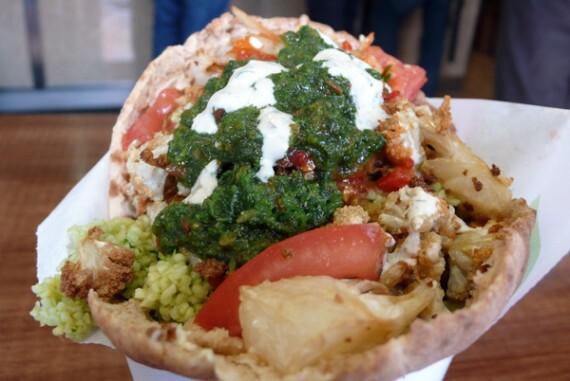 if you are reading this maoz, please open up in LA ASAP. Don’t you just hate it when you see something you like ripped off, and hard working people’s livelihoods threatened? 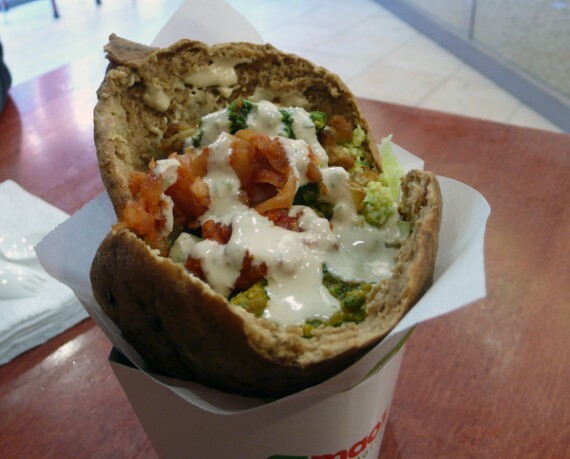 Back in 1991 two Israeli emgres, Nachman and Sima Milo, opened their very first Maoz restaurant in Amsterdam, The Netherlands. 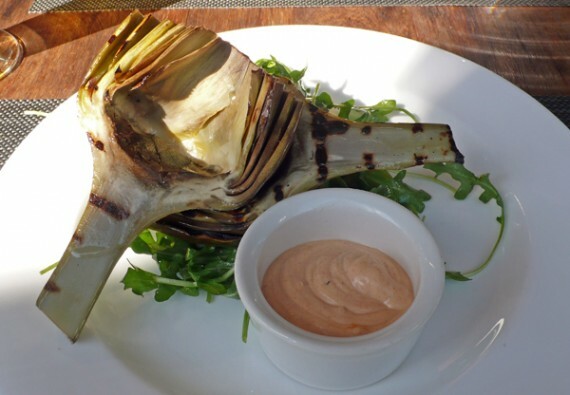 With a menu designed to be healthy, vegetarian, environmentally friendly, inexpensive and very tasty, the Milos quickly had a hit on their hands. 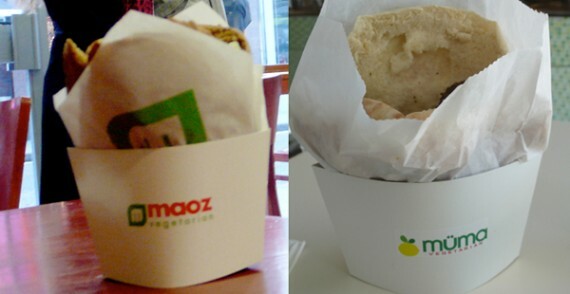 Now, Maoz has 22 restaurants globally. The outlets in London and Paris have a long line outside the door most days, and the Union Square outlet in Manhattan is often so crowded that it feels more like the subway station underneath than it does a modern eatery! As we reported on Wednesday, we were delighted with the apparent opening of a Maoz franchise location here in LA called “Muma Vegetarian“. The similarity of menu, corporate branding, restaurant ambience and artwork implied to us that this was a Maoz location, only named differently because of its close proximity to Mao’s Kitchen, a popular (vegan-friendly) Chinese restaurant half a block away. 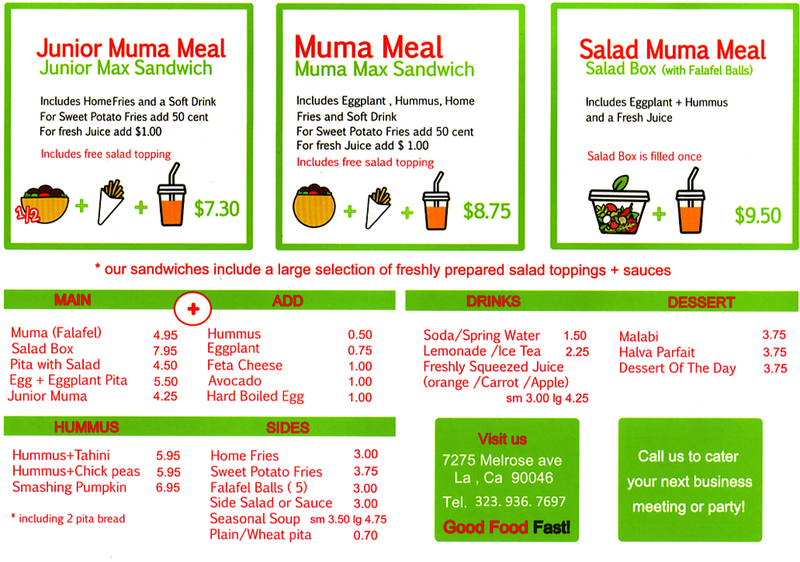 Have a look for yourself and compare Muma’s menu with the menu from Maoz. Nearly identical. At that point the manager was getting very defensive and a little loud (he even stepped out from behind the counter and led us to a table where he sat down so that the conversation could not be heard by others in the restaurant). Fearing that he might ask us to leave, we said “OK, no problem – was just wondering if you were part of Maoz. That’s all.”. Shortly after, we noticed the manager in the back room. He was glaring at us through a window in the door while engaged in an animated ‘phone call – we guessed it was with one of the three owners. Just as we were finishing up our meal he came from around the back of the counter and gave us a portion of pumpkin hummus and warm pita bread. He said: “Please accept this on the house. We make it here and call it Smashing Pumpkins.”. We wolfed down a few bites and left the restaurant right away. We were, frankly shocked as well. Muma appears to be shamelessly copying Maoz in great detail. From the look and feel of the food down to near-pixel perfect copies of their menu items, artwork and corporate identity. While we were originally impressed with the food, we wonder why anybody would want to eat at a restaurant owned by people with such a lack of integrity that they would brazenly steal another company’s entire identity. If they are that shameless, we’re sure the quality of the food is also suspect. 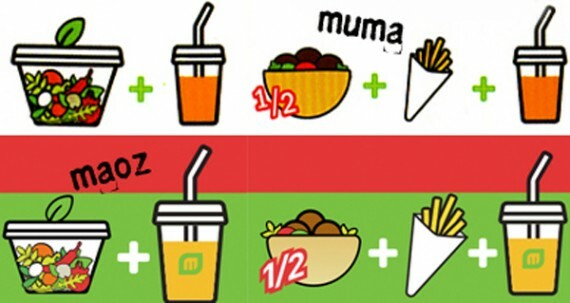 Until Maoz deal with Muma (and we’re sure that there are plenty of intellectual property issues here that I’m sure lawyers would love to get their hands on), we’d advise potential customers to stay away. After all, we can’t support such acts now, can we? on our recent trip to england, we spent one day and one night in liverpool. 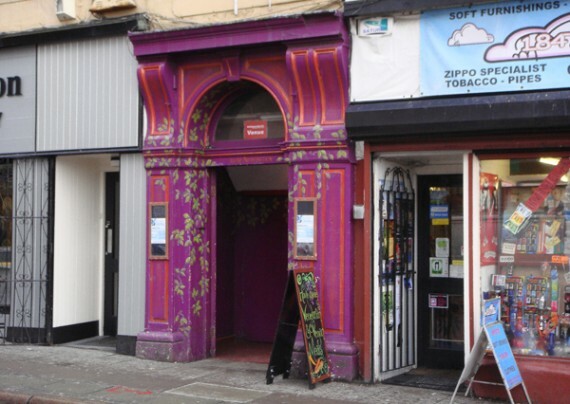 being the birthplace of the beatles, we just had to pay the city a visit…and of course, we were on the lookout for good vegan food while we were there. you know veganism is spreading like wildfire when this even this grey, industrial, port city in england has its very own website dedicated to vegetarian and vegan life. scouseveg.co.uk was a valuable resource for us while staying in liverpool, and it lead us to a very lovely all vegetarian and very vegan-friendly restaurant called the egg cafe. the egg cafe in liverpool. the egg cafe is a sweet little vegetarian lunch spot with a rotating menu of daily specials, and several vegan offerings. 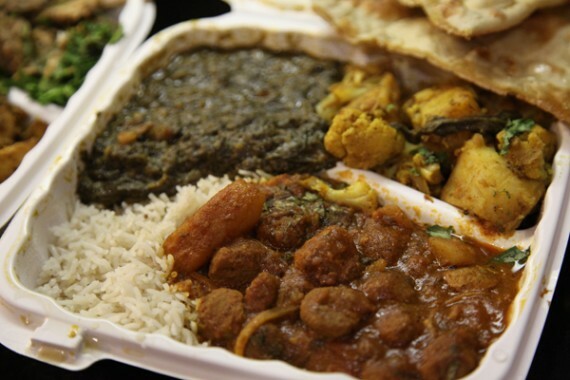 there was so much to choose from when we were there, from sandwiches and curries to soups and desserts. 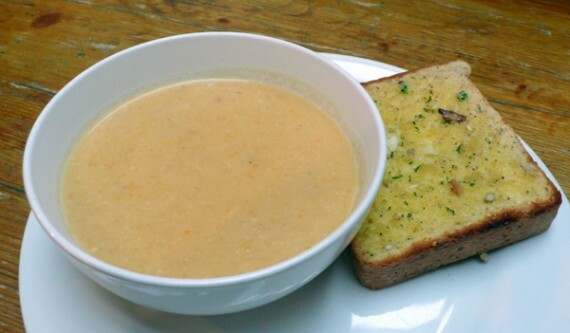 we started the meal off with a bowl of vegan creamed cauliflower soup and a large slice of garlic bread. although everything we ended up ordering at the egg cafe was tasty, the soup and garlic bread combo was definitely the highlight of the meal. 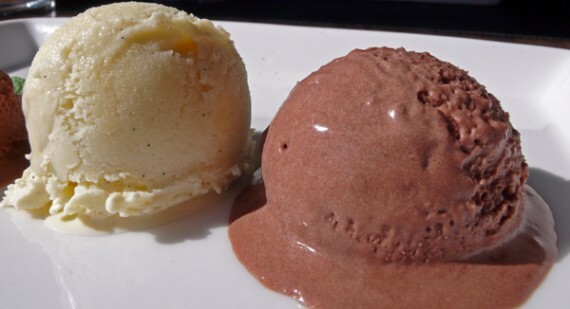 both were vegan, but both were incredibly rich and delicious. the soup was extremely creamy, and the bread was all thick and fluffy. plus, it was fresh and pipin’ hot, and the garlic and buttery spread on it was amazing. 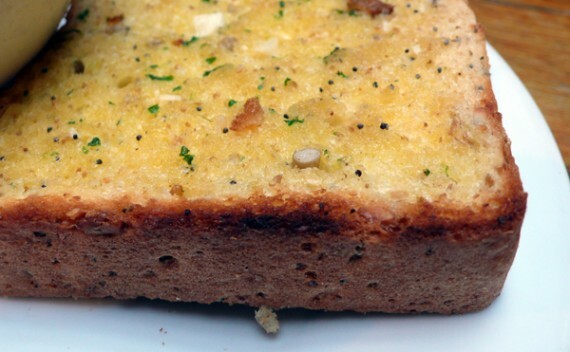 probably the best vegan garlic bread i’ve ever had. for a main meal, i ordered the hummus combination, which came with homemade hummus, pita bread, salad and pasta on the side. the fresh hummus plate really hit the spot, and i can’t fault it…however it did taste like something i could make at home. next time i visit the egg, i will go order something a little more special, like one of the vegan hot dishes. the hummus was creamy and covered in really great seasonings, definitely a great lunch if you are looking for something light. i didn’t touch the salad because it had bell peppers in it (which i HATE), but my husband tells me it was really good. my husband went for a curry-inspired dish: the vegan tandori mushrooms with creamy sauce. the white yogurty sauce was so convincing, we had to go double check it was vegan! all of it was quite excellent. 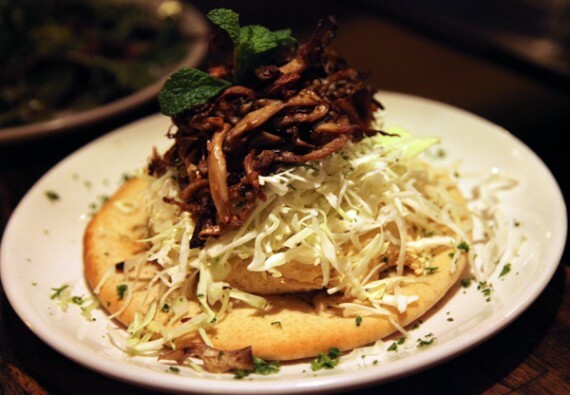 the tandori mushrooms were plump and well seasoned. they were bright red and had the same flavor as tandori chicken of the same color. 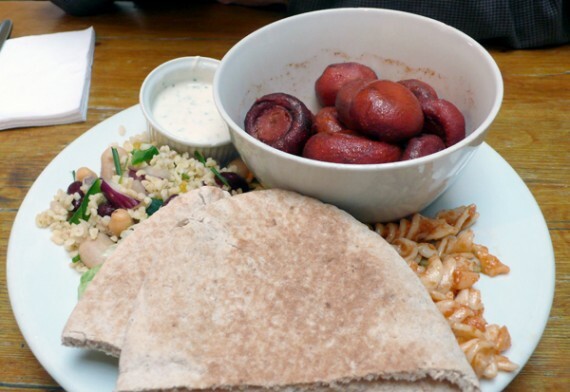 they also came with pita and side salads. it all wrapped up very nicely as a curry mushroom sandwich. overall, the egg cafe was a great find. all the food was good, and some of it was downright excellent. 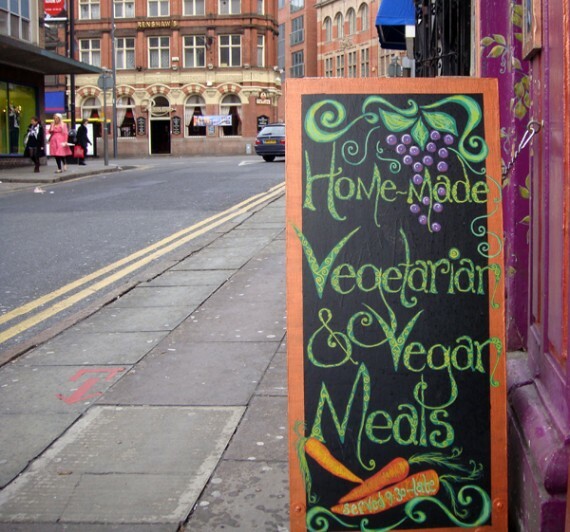 for vegans in liverpool, this place is a must visit. the atmosphere is pretty awesome too. you order at the counter and then sit at a long communal table. it isn’t crowded or uncomfortable though, and the decorations are fun and colorful. there’s no alcohol license, but feel free to byob! interior of the egg cafe in liverpool. the egg is located up two flights of stairs, and the sign is on the ground. so be sure not to miss it! look out for the trippy purple building. oh, and by the way…any vegetarian restaurant with this on the wall is okay in my book. i love liverpool. beatles decorations at the egg cafe in liverpool. i particularly love the picture of paul.